It’s that time again. Holiday season? Naw, it’s World Junior time. Last week, Hockey Canada announced the roster of invitees for this year’s selection camp that will be held in Blainville, Que. starting on Saturday. This year more than most, it feels like we will be talking more about the players that aren’t available to Canada than the ones that are actually on the team. On top of the guys in the NHL, we learned earlier this week that presumptive first overall pick in the 2017 NHL Entry Draft, Nolan Patrick will miss the tournament thanks to a lingering injury. 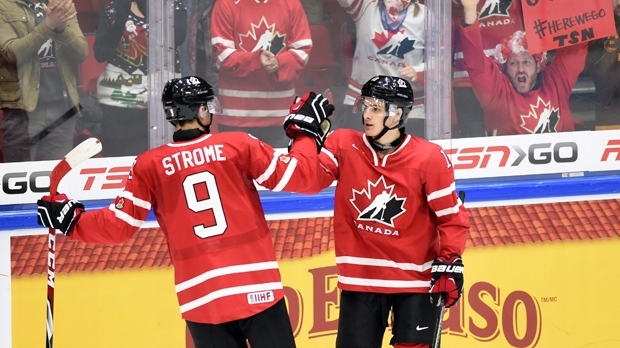 During the evaluation camp this summer, I took at look at what Team Canada might look like in this year’s IIHF World Junior Hockey Championship. While many of the players I expected to be a part of the team will be at the selection camp next week, there are a number of players that will be unavailable. With that said, let’s take a look at what Team Canada’s roster could look like when the tournament begins on Boxing Day. With Mitch Marner, Lawson Crouse and Travis Konecny in the NHL, Canada will be without their best three wingers. If the team hopes to be better than last year’s disappointing performance, it’s going to have to be the stars down the middle that do the heavy lifting. The team hasn’t ruled out Anthony Beauvillier being available, but given that he is getting ice time on the wing with John Tavares, it’s unlikely the Islanders will loan him out for the tournament. Dylan Strome and Mat Barzal were returned to their junior teams after a handful of NHL games each. The two centres are going to be the key to any success Canada has. Strome will undoubtedly lead the top offensive line and powerplay while Barzal will likely be tasked with providing the team with a lot of secondary scoring while lining up against the top opponents. We’re likely to see Mitchell Stephens as the captain and top penalty killer – moving to the wing to play with Barzal. There are a lot of open spots in the bottom-6 going into the selection camp and given the players competing, we are likely to see a Team Canada based around speed and versatility. Normally, NCAA players start behind the eight ball when it comes to Hockey Canada, but Tyson Jost has been so good during his Freshman season at North Dakota that it’s hard to see a scenario where he isn’t playing a major role on this team. He’s the most talented left winger at the camp – and that includes Blue Jackets 3rd overall draft pick Pierre-Luc Dubois. In a bottom-6 that is totally up in the air, Wagner and Senyshyn are the two that I might be going out on a limb with. Like last year, this team might have trouble scoring goals 5 on 5 so a player with the finishing ability of Senyshyn could be very valuable. Playing on a line with a possession driver like McLeod could result in a very dynamic offensive duo. Austin Wagner is a guy who might be a little more unknown. The Los Angeles Kings 4th round pick brings strong play in all three zones and after a great showing at the Canada/Russia series, he could have the inside track over guys like Brett Howden and Dillon Dube. Rounding out the 13 forwards, Anthony Cirelli and Sam Steel have been tremendous to start this season and players like Roy and Joseph bring positional versatility that is often coveted in tournaments like this. Jakob Chychrun would have been the team’s defensive rock but the Coyotes have said he will not be made available to Canada. As a result, it’s going to be Thomas Chabot that plays the role of minute-eating 1D. Paired with Juulsen, the two will almost certainly be relied upon to be the team’s shutdown pair. In a short tournament like this, familiarity with teammates can go a long way – which is why I think a pairing of Lauzon and Myers would be both likely and very beneficial. The Rouyn-Noranda teammates are the rock of the CHL’s 10th ranked team and would be a steady presence on the blue line. The seventh spot will likely come down to Girard or Victor Mete of the London Knights – whichever wins the role could serve as an offensively focused power play specialist if they can crack the lineup. Of the three goalies invited to selection camp, Connor Ingram and Carter Hart have better numbers than Michael McNiven but they also play for better teams.. They have been back and forth all year at the top the WHL Sv% standings, with Hart having a better performance in the Canada/Russia series. The competition is likely wide open and will come down to who has the best showing in the pre-tournament games. All three have the skill to have a much better showing than MacKenzie Blackwood did last year. If I am forced to pick a starter today, I would go with Carter Hart and have Michael McNiven backing him up. Canada won gold two years ago on the backs of tremendous play from Connor McDavid and Max Domi. On the flip side, last year’s performance was one to forget – the team was underwhelming offensively and found themselves playing incredibly undisciplined hockey. This year, Canada likely enters the tournament chasing Team USA as the favourites. A young Finnish team shouldn’t be a factor the way they were last year but Sweden looks to be very strong and you should never count out the Russians – who always seem to have something to prove when they show up at the World Juniors. I think Canada will medal but a lot is going to have to bounce their way – and they’ll need a very strong goaltending performance – if they hope to win another gold on home ice. Previous Fantasy World Junior: What if we were suffering through another lockout?